Adjusting the lighting quality could have a biggest impact on how the game runs. Check out the rest of our Fallout 76 guides. 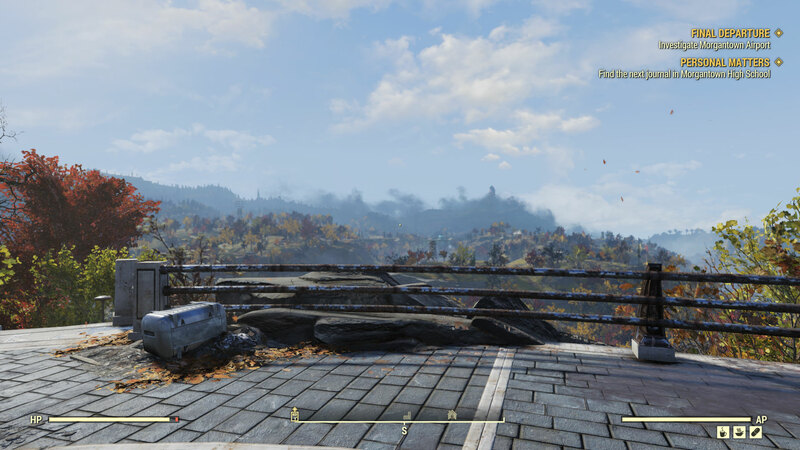 Fallout 76's beta is finally playable on PC, which means we can dig into all sorts of graphics settings and customization options that weren't available in the Xbox One version. The PC beta ran for about a week, and we were able to do some benchmarks the first few days. However, Bethesda later locked down the framerate to 63fps maximum, but the latest patch has reversed that and fixed the 'speed hacking' bugs. 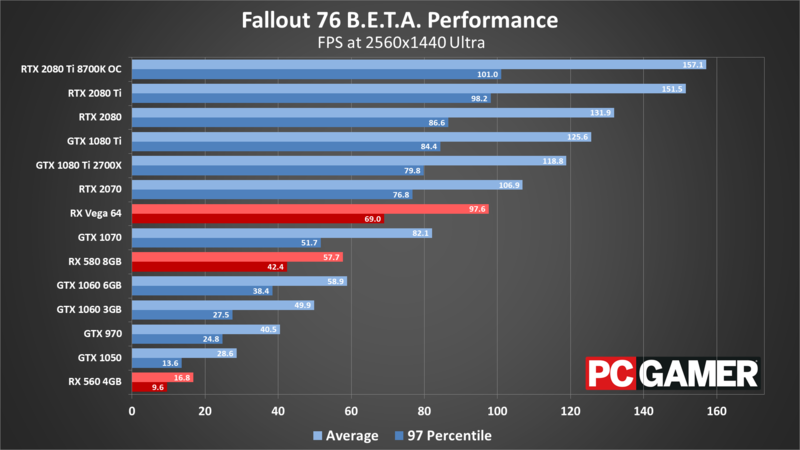 That means these benchmarks should roughly correspond to the performance you can expect, though game updates may have changed the values somewhat over time. We also checked how the various settings affect, or don't affect, performance. 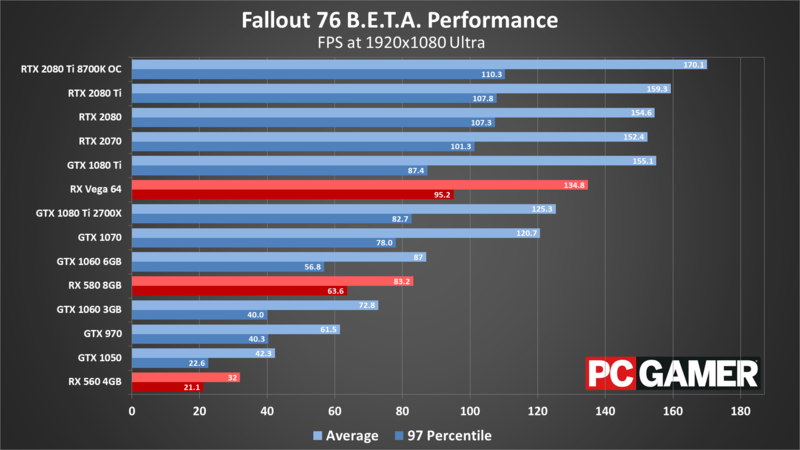 The good news: a GTX 1060 6GB can run Fallout 76 at 1080 ultra, 60 fps. Let's start with a look at the graphics options in Fallout 76. The video options might look extensive, but you'll notice a few surprising omissions, and having four separate sliders for fade distance isn't really necessary. Fundamentally, there are six settings you can adjust, and three of them had a negligible impact on performance. Here are the options for each graphics setting, as well as an estimate of the potential performance gains based on testing with a GTX 1060 6GB. Preset: Low / Medium / High / Ultra. High looks about the same as ultra and only runs about 5 percent faster, while medium boosts performance by around 25 percent, and the low preset boosts performance by 35-40 percent. Texture quality: Low / Medium / High. Dropping to low had almost no effect on performance, at least with a GTX 1060 6GB. For cards with less memory, this may have more of an impact. At 1080p, low texture quality uses around 2.0-2.5GB VRAM, medium uses 2.5-3.0GB, and high uses 4.5-5.0GB. At 4k ultra, the maximum VRAM used is about 5.5GB (barring memory leaks). Water quality: Low / Medium / High. Our test area didn't have a lot of water, which holds for many areas in the game. Not surprisingly, we saw no significant change in performance when setting this to low. Lighting quality: Low / Medium / High. This is the single most demanding setting, and performance improved by around 12 percent at low quality. Shadow quality: Low / Medium / High / Ultra. Dropping from ultra to low improved performance by about 4 percent. Shadow distance: Low / Medium / High. The second most demanding setting. Going from high to low boosted framerates by 7 percent. Combined, setting all four of these sliders to minimum caused less than a 1 percent improvement in performance. These could have a slightly larger impact with a slower CPU. None of these are really graphics settings, but they affect the UI and can be changed as you see fit. 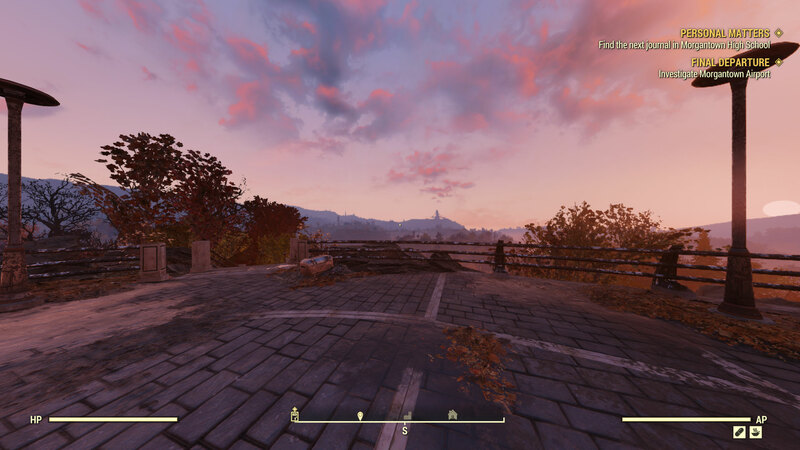 It should be noted that comparing performance and image quality in Fallout 76 is a bit tricky, as the game has dynamic time of day and weather. Changing most settings requires you to restart as well, which means by the time you get back into the game, it may look different. The low preset from the above gallery seems to lack shadows, but I believe that's because there was a cloud overhead when I captured the image. The same goes for the tree shadow on the left, which moved with the sun. 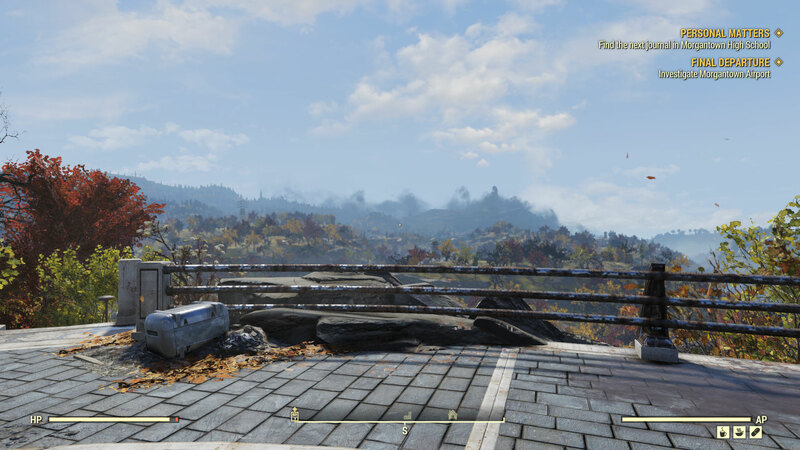 At present, the high and ultra presets look better, but Fallout 76 looks okay even at medium or low quality. Framerate, VSync and anti-aliasing are conspicuously absent from the in-game settings, and there's no FOV slider, either. For the in-game menu, what you see above is what you get. But that's not quite the full story. It should be possible to tweak some of the settings manually, and there's an sAntiAliasing=TAA line, so the game does support anti-aliasing even if it doesn't show up in the in-game options. 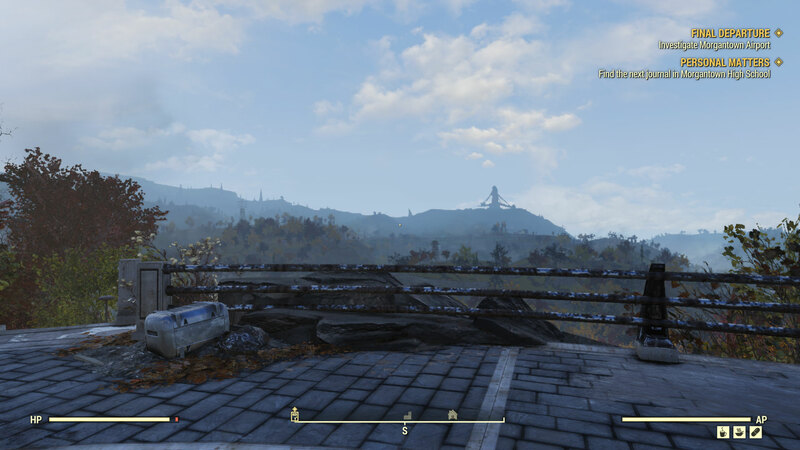 As for FOV adjustment, there are two lines in the Fallout76.ini file: "fDefaultWorldFOV=70" and "fDefault1stPersonFOV=80," so FOV should be tweakable. Those are the right lines, but you actually need to put them in a file you create called Fallout76Custom.ini. If you adjust FOV in those files, it will work in-game. FOV will also auto-adjust if you put in an ultrawide resolution. Default 90 FOV, click for fullsize. 100 FOV, click for fullsize. 130 FOV, click for fullsize. You can also edit the Low.ini, Medium.ini, High.ini, and Ultra.ini files in the game directory to enable / disable motion blur and depth of field, though distant objects are still lower resolution. The framerate can be unlocked, and we ran some initial benchmarks (see below). 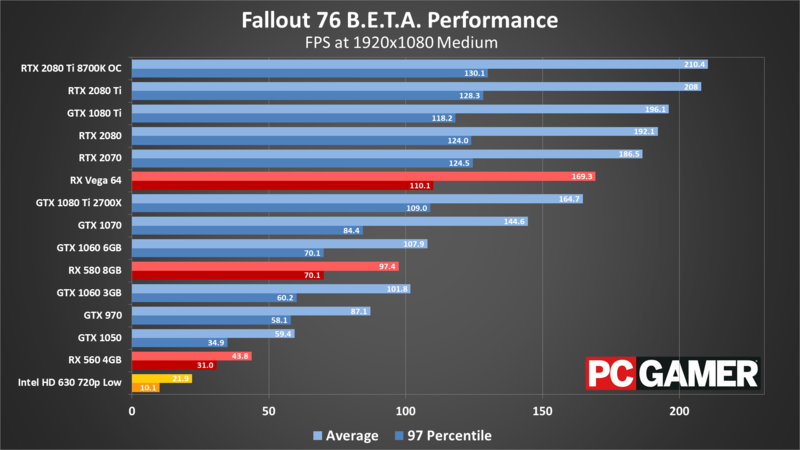 Initially, as with previous Bethesda RPGs, unlocking the framerate and going above 144fps causes problems with physics and game speed calculations. After ten years of this, however, Bethesda has apparently taken time to create a fix for the problem. The current version of the game does not accelerate even at 200+ fps. 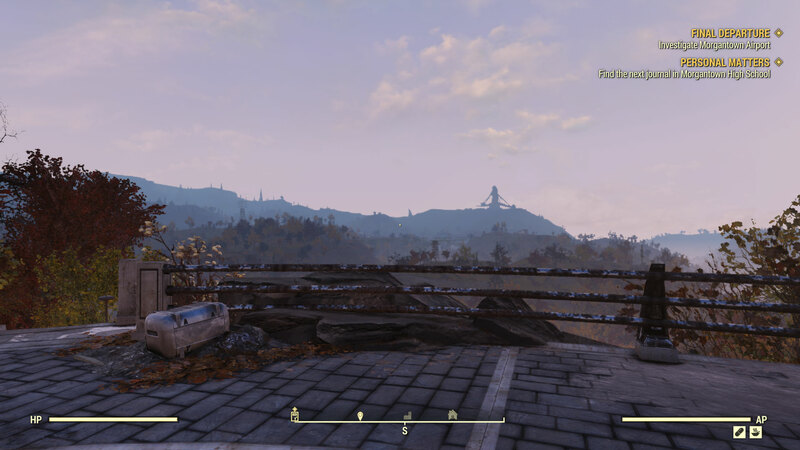 So how does Fallout 76 run without an FPS cap? Here are a few benchmarks, run on a Core i9-9900K CPU. Click for fullsize, swipe left/right for more charts. With a limited amount of time during the beta, plus the need to swap GPUs and restart the game for each change in settings, we aren't able to do a full suite of testing. We ran through a decent number of graphics cards on a Core i9-9900K testbed, along with testing the 1080 Ti on a Ryzen 7 2700X, and the 2080 Ti with an overclocked 8700K. Since this is a beta, these results should be taken as preliminary estimates only. Most of the GPUs fall about where you'd expect. The RX 580 8GB and GTX 1060 6GB end up performing similarly, with Nvidia having slightly higher average fps but AMD delivering better minimum fps. Both come close to hitting 60fps at 1440p, with 1080p ultra running great. For budget cards, the GTX 1050 universally beats the RX 560 4GB, even with half the VRAM. 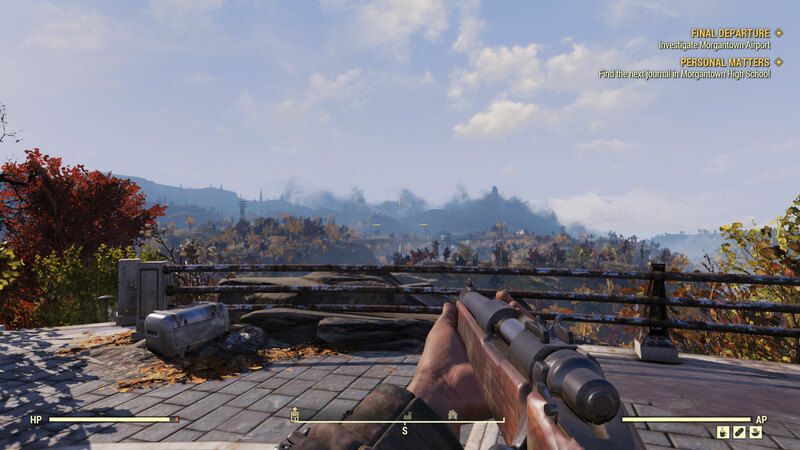 And at the extreme budget end of the spectrum, Intel's HD Graphics 630 running at 720p and minimum quality does manage to run Fallout 76, but it wasn't really what I'd call 'playable.' The input lag and general choppiness made it rough. Perhaps going to even lower resolutions (640x400) would suffice, but reading text and the UI might not work at such a low resolution. At the high-end, the RX Vega 64 easily runs 1440p at more than 60fps, but framerates get cut in half at 4k. A GTX 1070 Ti should perform about the same as the Vega 64. Moving up the ladder, the 1080 Ti has some oddities with minimum fps at times, while the RTX cards do a bit better. As we've seen in other games, the RTX 2080 and GTX 1080 Ti deliver very similar performance, and the same should hold for the 2070 and 1080. should be capable of hitting 60fps at 4k ultra. What about CPU limitations? Intel's fastest CPUs clearly hold an advantage over the Ryzen 7 2700X at lower resolutions, about 25 percent at 1080p. That drops to just 6 percent at 1440p, and the CPUs are tied at 4k (with a 1080 Ti). The i9-9900K is also slightly slower than an overclocked i7-8700K, at least at 1080p, but it's basically a tie. Jarred also did some limited testing on an old 1st Gen Core i7-965 Extreme Edition Bloomfield CPU. Granted, it has 12GB DDR2 and a GTX 1080 Ti, but if you're worried an i5-2500K may be insufficient, that doesn't appear to be the case. Running off a hard drive, the game was more prone to fps dips, but at 3840x1600 in the outdoor areas of the game, it still averaged 91fps, with minimums of 40fps. Not bad for a 10-year-old processor! There's definitely a lot of room for improvement in minimum framerates right now. Some of our first run test results were very low, but a second run would help smooth things out. There's also potential for time of day to impact framerates, so there may be more variation between runs than in other games we've benchmarked. 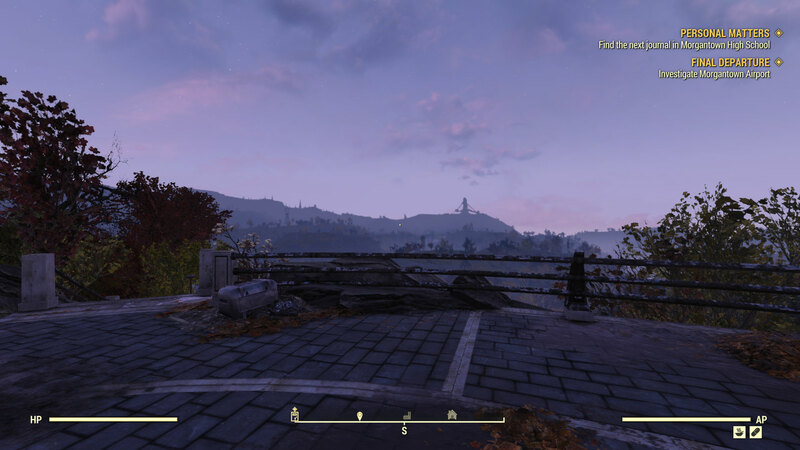 Bethesda has indicated that updates are in progress to improve performance, and was able to address the potential for speed hacking if you remove the framerate cap. Hopefully things continue to improve over the coming months.